In my family, food is love. No matter which member of my family - immediate or extended - I speak with on any given day, the first question after initial pleasantries have been exchanged is “so, what did you have for [insert the most recent meal] today?” This focus on food isn’t unique to my family - it’s ingrained in Hindu culture where the ability to feed others is considered an honor and privilege. When I lived in India a few years ago I was in awe of how gracious people were when they had guests. First, guests are offered water. Next comes milky, cardamom and ginger spiced chai (made at home), or some kind of fresh juice, or soda that a young boy, generally in frayed jeans and flip flops, magically delivers to the door of the home along with some namkeens such as flaky samosas with a sweet and spicy tamarind chutney, or crispy fried pakoras with onions and green chilies wrapped in newspaper. Sometimes, depending on the heat that day, the host may opt to serve some fresh ice cream - mango, pineapple, fig, saffron almond and pistachio - whatever is known as the specialty of the local purveyors. Rarely do guests call ahead. They simply show up, and unlike the west where such an act is generally considered an imposition, these impromptu gatherings are welcome and filled with love. Food as an expression of love extends beyond the living through Hindu funeral rituals known as Shraadh. Every detail about how to ensure that a soul passes peacefully into the afterlife is considered during the initial Shraadh period, down to each ingredient used during the various ceremonies. Reading about Shraadh this week was interesting and I learned quite bit about the inception of the practice, about the fortnights that make up the lunar calendar, and why we serve milk based sweets and offer black sesame seeds to our ancestors. In case you're curious it's because cows are sacred and their milk is considered pure, and black sesame seeds are believed to have the capacity to absorb spiritual purity and remove any spiritually impure components. The act of offering black sesame seeds on behalf of our ancestors is said to give their souls the energy required to move-on to the next spiritual plane and satisfy any unfulfilled desires so they may find peace in the afterlife. While all of this is incredibly interesting, I only learned about these things by researching them. Explanations are not a part of the Shraadh ritual - or any other Hindu ritual for that matter. In my experience I've found that many Hindu rituals are rooted in blind faith and doing what others before you did, regardless of whether you understand why. In the case of Shraadh, it’s to ensure that your dearly departed loved one doesn't get stuck in purgatory and curse you and other members of your family. I've always been in awe of people like my mother and sister, whose unwavering faith has seen them through the most difficult of times. This is a fact that has made me sad from time to time, but I've always been someone who needs to understand the why. My family has been lucky because we have had priests in our lives who do provide explanations. When my father passed away 13 years ago, we found a priest in India who did explain each part of the ceremony - and that was helpful to me. But providing these types of explanations is not a common practice. So what about those of us living thousands of miles away from the funeral pyres along the Ganges river? It's difficult to navigate a paradox which places so much emphasis on the importance of faith and true devotion when performing various rituals, but then goes on to say that if you aren't going to use the right ingredients or serve the right food it is better to do nothing at all. I struggle with the idea that if you don't do everything exactly as instructed in the scriptures, the soul of your loved one will linger on, unhappy and unable to move on. The truth is, I don't always know what to believe. What I do know is that my dad was an incredibly social men with an expansive palate. He loved nothing more than gathering together with friends and feeding them new dishes that he tried while in another part of the country on a business trip. This is how he introduced our circle of friends to quesadillas (or casa dillas as my parents and all their friends called them) on my 8th birthday. It's also why, at his funeral, friends we had known for 30 years showed up in Princeton, New Jersey on a cold, wet, February day and eulogized him with stories about the first gathering in our newly built home in Denver in 1978, when he made everyone sit on the ground in a big circle in the basement, and walked around popping homemade gulab jamuns in their mouths. This past Monday was the first day of the 2018 Shraadh period. My family has been having feasts honoring my father and other relatives during this period for several years now. 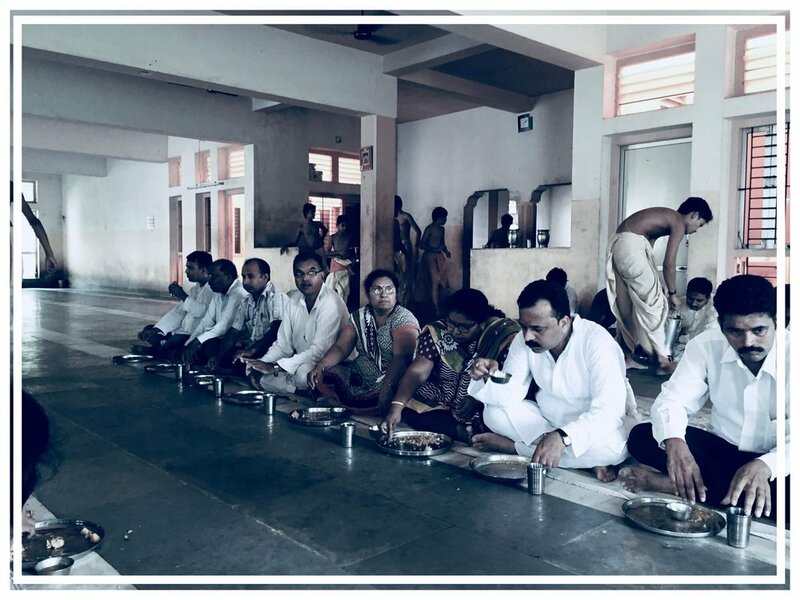 While Shraadh meals range from simple to elaborate, I've always seen them as meals that are meant to be shared with others in remembrance of our loved ones. In my family we have tried to honor my father by making things that we think he would have enjoyed if he was sitting down at the table with us. I remember the first Shraadh we observed after my father's passed away. My mother spent the day making spongy puran pori, a whole wheat flatbread stuffed with cardamom and sweetened lentils, cooked on a griddle and slathered in fresh ghee, along with spicy cumin, coriander and chili stuffed eggplants and potatoes. For dessert she made kheer, a slow-cooked rice pudding with cardamom and almonds that is a staple during Shraadh. And then the following year we made burritos. Perhaps it's not entirely in line with what we're supposed to be doing at this time of year, but I like to believe that my father, and so many of the others who have passed on, are able to feel our faith, devotion, and above all else, our love, and are at peace knowing that we're gathering together and enjoying good food in their honor.